The Radeon Pro WX 3100 graphics card is redefining entry-level workstation graphics. Based on the "Polaris" GPU architecture, the Radeon Pro WX 3100 offers higher performance, providing users with mainstream performance and advanced features all at an entry-level workstation graphics cost point. 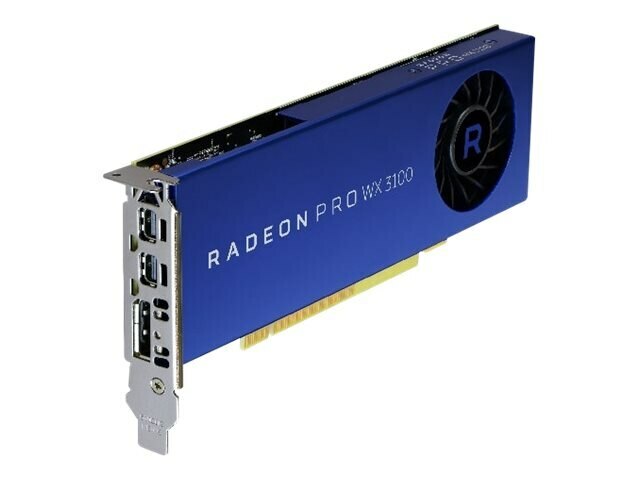 The Radeon Pro WX 3100 graphics card is based on the fourth-generation of Graphics Core Next (GCN) GPU architecture and, like its predecessor, can perform graphic and arithmetic instructions in parallel. Helps speed up time required to complete single precision operations used within Video Effects and Rendering, Signal Processing, Transcoding and Digital Rendering applications where high performance takes precedence. Enables professionals to tap into the parallel computing power of modern GPUs and multi-core CPUs to accelerate compute-intensive tasks in leading CAD/CAM/CAE and Media & Entertainment applications that support OpenCL. The Radeon Pro WX 3100 graphics card supports OpenCL 2.0, allowing developers to take advantage of new features that give GPUs more freedom to do the work they are designed to do. A powerful low-overhead graphics API that gives software developers complete access to the performance, efficiency, and capabilities of Radeon Pro GPUs and multi-core CPUs.